Sunday morning the girls and I ran 13 miles around Gardiner. We started out at my house and ran into town, did a little loop around a cute neighborhood, then headed back to my house. The route I chose had some awesome wide shoulders, which is always helpful when running with a group. Safety is quite important. When we did our little in town loop, there was hardly any traffic at all, we got to run down the middle of the road. Actually, I took them to the intown loop I had done the day before. To be honest, the day before, in the slushy snow, the road conditions were better. On Sunday, this route had quite a bit of icy spots and we took turns slipping and sliding. When we finished our run, we hung out in my kitchen by the woodstove. Stacy held strong with her Clean Food Challenge and drank her protein smoothie she made at home. Carrie and I indulged in the delicious scones Ward made for us. And Kim enjoyed a yummy protein smoothie. I do love ending a run at my house where we can sit around and relax for a moment, eat, and just be happy with our accomplishments. Because Sunday was 3/4 and was Jamie's birthday. 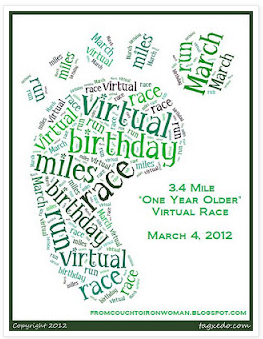 She hosted a virtual run on her blog if you ran 3.4 miles on her birthday. I wasn't about to go out for another 3.4 miles (I was wiped), so I am dedicating 3.4 miles of my 13 miles to Jamie's birthday. Happy Belated Birthday!!! We completed 13 miles in 2:13. Today's photo of the day - 5 P.M. This was what I was doing at 5 P.M. today. I actually started my run at 4:58, which meant I was running. The sun was shining (yay for daylight!) and it was such a glorious run. I actually broke out my Asics DS Racers. I haven't worn them since the summer. They felt heavenly on my feet. So light and airy. I took Pepper along with me and we headed into town because I had pick up my car at Jill and Wade's house. I didn't start out the run aiming for it to be a fast run, but it just felt right. Mile #2 is all uphill, a long gradual uphill with a very steep portion at the peak. I think the key to my speedier run tonight is that I had made dinner just before heading out the door, which meant that I knew what was waiting for me when I got home AND I was absolutely starving. And what dinner did I have waiting for me? I got this idea from Stacy on Pinterest. I am loving that Pinterest has basically replaced my need to look through any cookbooks. This is Lo Mein is absolutely fabulous. I'm going to blame my PMS for now wanting to eat lo mein at 9pm. I'll have to try that one! Great job on your 13 miler! I LOVE Pinterest! It really helps me find our new recipe of the week, speaking of which I need to find one for this week! Which recipe did you pick out for the week? Great 13 mile run! That dish looks like something Allan would love! I've actually sold some of my cookbooks on Amazon! :) I think I'll have to see the rest at a garage sale as well! That dish looks so yum! Good work on the run! :) Have a great Wednesday! Great 13 miles...I'm with you on Pinterest! oh my goodness, that lo mein looks delicious! and I don't even eat beef. Of course I'd comment on the food first. LOL. Great job on your run!